Mrs. Kinch has returned from London victorious and rhapsodising about the shows she saw in the West End. She also brought me Buccaneers cake from Fortnum & Masons, which is delicious and so dense you could shoot it through the sides of Russian tanks. No news on the house beyond poking the Mortgage lenders. The object of Yes Grand Duke is to gain as many points as possible with the player with the most points being declared the winner at the end. The players are members of the Grand Dukes council of advisors an informal group of nobles who advise the Grand Duke on policy. The Grand Duke invariably follows the majority decision of the council. Each player begins the game with a number of Interest Cards. Each card represents an interest or agenda the player wishes to pursue and can be positive or negative. The various interests a player can have are listed below and are described in full on the Interest Sheet. Yes Grand Duke is made up of rounds of table discussion, free discussion and voting. 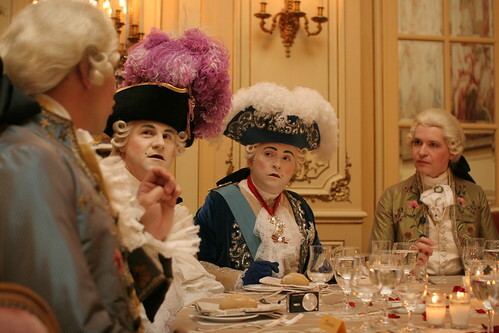 In table discussion the Grand Duke will describe the problems besetting the Duchy to the players, who will then discuss, bicker and connive with each other and then present their views to the Grand Duke in a round of voting. The Grand Duke will follow the majority view and every so often the Ducal Chamberlain will give the results of the councils deliberations. Example: After discussion, the Grand Duke authorises limited conscription. This is a move that benefits Military and Foreign Prestige as it gives him a large standing army and convinces foreign powers that Little Siskington is not to be messed with. It hurts A well order Treasury as you have to pay for all those uniforms, muskets and such and is doubly unpopular with the Peasantry, who rather liked being civilians. The result of the decision would be Military, Foreign Prestige +1, A well ordered Treasury -1 and Peasantry -2. Players score one point for every bonus to one of their interests and lose one for every penalty. If a player has a negative interest in something, he gains a point for every penalty to that interest and loses one for every positive development. Example: A player who had three Interest Cards reading; Military, Church and Peasantry (negative) would do very well out of the example above, gaining a point for Military, none of Church and two points for a negative interest in Peasantry. A player may attempt to insure against disaster if he thinks a decision will go against him by making an assertion. An assertion is a publically announced statement which begins, “Grand Duke, I assert that X will happen if Y decision is taken.” The Ducal Chamberlain will indicate if the assertion and if so will make a note of it. If he is proved right, he gains a point and if he is proven wrong by developments, he loses a point. Players may not show their Interest Cards to each other under any circumstances, but are free to discuss them with others. There are special situations where a player can compel another to disclose a card, but this will be written on a special card. The Grand Duke must always be addressed as “Your Grace” or “Grand Duke”. He should be referred to as “His Grace”. Lordly players should be addressed as “My Lord” and should be referred to as “Lord”. Bishops should be addressed as “My Lord” or “Bishop” and should be referred to as “The Right Reverend”. No-one may sit while the Grand Duke stands. No Lord or Bishop may sit while in conversation with a Lady who is standing. Any Lord, excepting the Bishops, who is unmarried at games end will lose three points. A Bishop gains one point for every marriage he solemnizes. Ladies may bring their wit and amiability to the deliberations of the council, but they may not vote. Lords may challenge each other to a duel, losing a duel gains the loser a point and he forfeits the right to vote in the next round. The winner gains two points. Duelling is not for the faint hearted. A scene from an affair of light cavalry over the weekend. Gaelcon, Ireland's largest and oldest gaming convention was over the weekend - my involvement was pretty low key this year compared to previous years, but any doubts I might of hand as to the future of the convention were most assuredly put to rest - it was fantastic, well organised and very well attended. I ran two games over the con, a LARP called "Yes, Grand Duke" which was set in the comic opera state of The Grand Duchy of Little Siskington in the late 18th century. It was a great success, with 24 players taking on the roles of advisors to the Grand Duke. I'll include some more about this game in a later blog post, but in brief, each player plays the role of an advisor to the head of state who they try to sway by reasoned argument, flattery and shouting. "Voltaire has been kicked out by Frederick the Great and is looking for somewhere to hang his hat, we have received word that he is likely to attempt to lodge in the Duchy, what do you suppose we should do?" The Grand Duke allows the players to discuss the problem like gentlemen, calls for a show of hands and then makes an impartial and entirely independant decision based on the majority. There's also a lot of faff about duelling and arranging marriages and the like, but the bones of the game is the politics, which is great fun. And lest you think I did something clever in putting this game together, a fiercely keen American by the name of Greg Stolze did, though his game was about American politics and was called Executive Decision. And speaking of stealing other peoples work, I ran six games of Jim Wallman's En Avant diceless Napoleonic wargame over the weekend. I ran a variant of the latest cavalry teaser from Battlegames four times and two other homebrewed scenarios as well. A few more games would have been played, if I had not foolishly attempted to keep with Donogh and others at the bar and ended up drinking well, but not wisely. I turned up somewhat the worse for wear on Sunday afternoon. Scenario number one, had a British battalion sent out to cover some returning foragers running into a much larger French force and relying on front and bluff to buy enough time for the foragers to get away. This did not end well, the British player made some very imaginative moves, marching troops in a circle in a gap between two buildings, making extensive use of skirmishers and the regimental band, unfortunately the French player thinking that the marching men and distant drums signalled the approach of British reinforcements, resolved to attacked immediately. It was still a close run thing. The second game was a holding action, where a small force of British riflemen backed up by one gun of the Royal Horse Artillery had to delay a French force for a short time and withdraw with their force intact. This did not end well for the British, not that any game that weekend did, and while they did manage to hold up the French, a considered but daring French player took both riflemen and gun and still managed to make it off the board in time. I, of course, forgot to bring my camera and didn't have the wit use my iPhone, so the above is one of two pictures that Donogh shot over the weekend. It shows a moment during one of the Cavalry scenarios, where British and French squadrons having "threaded" each other turn to charge again. On the whole, a very rewarding weekend, I thoroughly enjoyed myself, caught up with a lot of old friends, umpired some really enjoyable games, my feet still ache from dancing and I've sworn off the sauce for at least a month. Capital. I can't wait until next year. French infantry battalions, the 22ieme Ligne and the Swiss Legion. Storing figures has always been a problem, particularly en masse. It's probably one of the most important question any gamer is going to have to ask himself as it dictates where and when and how he can play with his figures. My choice of steel paper lined box files was made for several reasons, they are relatively cheap, magnetic sheeting keeps the chaps in line, they are relatively portable and infinitely expandable. This allows me to play games at home without having to trawl through the whole collection looking for such and such a battalion and only bring those troops that I actually need for a game elsewhere. 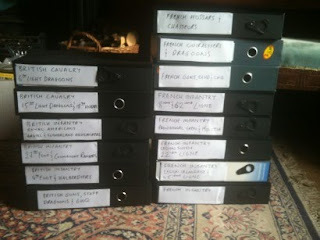 My 6mm figures are all stored in video boxes filled with foam and steel paper. These are admirable as they protect the figures and are extremely portable. The only issue is finding the damn boxes, as they are not really the thing anymore. Weather - freezing. Definately bringing gloves to work tonight. Mrs. Kinch - crankiness abating due to upcoming London trip. Gaming - this is where I'll be spending the weekend. You'll also find Donogh there, shooting Afghans for fun and profit. Look upon the organisation skills of Kinch ye Mighty and despair! In an uncharacteristic burst of organisational activity brought on by the arrival of some steel paper from Trevor at Magnetic Displays, I settled down to finish (-ahem- continue) organising my troops. Each deed box has been lined with steel paper and the troops have magnetic sheeting stuck to their bases. I'll take a shot of an infantry box when I have the chance to shoot one in daylight rather than the muddy specimen up above. Each box holds two Charge! style infantry battalions or two regiments of cavalry, with transport, camp followers and wounded. Some regiments are waiting to be housed, but the back of the job is broken. There are a few that remain to be kitted out with wounded and transport, but there are plenty of battalions to be going on with. 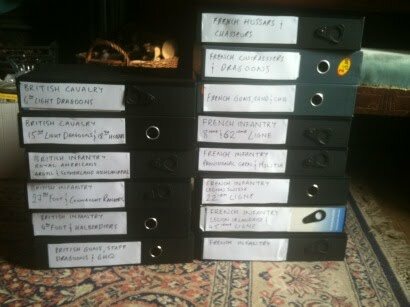 New arrivals will necessitate new boxes and more steel paper, I shall have to order some more in order to accomodate the British heavies and French chasseurs. It also struck me that I could use some of my spare Peninsular British figures are late war Portuguese or Spanish troops, as it is highly unlikely that I will require 300 odd Americans. I'm leaning more towards Portuguese at present as the bicorne clad Spanish infantry were certainly striking and it would be a shame not to field some. House - a comedy of foot dragging, evasion and delay on the part of the broker emeliorated only by constant nagging on the part of the customer. Mrs. Kinch - breezy, continuing irritable with reference to the above, crankiness emeliorated by looming trip to see Passion in the West End. I have often comforted myself that should Mrs. Kinch after decide to run away it'll most likely be with an elderly homosexual Jew. As the sun rises over Spurlash Abajo, the 4th Foot and the Connaught Rangers await the French onslaught. I took the opportunity to enjoy a few days off before I return to the night shift. I took Mrs. Kinch to dinner on Friday and then to a movie, the formulaic, but thoroughly enjoyable "Despicable Me". I also had the chance to catch up with some friends, most notably Uber, Savage and Young Master Von Gorman, all of whom I had not seen in some time and whose company I hope to enjoy at Gaelcon. No news regarding the house unfortunately, though the lender was pestering me on Friday for more documentation, which was duly supplied. A studied and entirely pretended indifferance to the whole process is beginning to appear to be the best course of action at present. A copy of the Classic Wargamer's Journal greeted me on the mat on Friday morning and I took great pleasure in reading it, particularly Stuart Asquiths contributions. My own piece seemed quite paltry by comparison, I shall have to do better. Having gently, but firmly booted Mrs. Kinch out of the house into the cold, cruel world there to earn a crust and get the means of keeping me in the style to which I hope to grow accustomed, I settled down to christen my new hex mats. I choose Spurlash Down from CWJ as an engagement that was manageable, without being too small. Peninsular French and British troops took the place of the Electoral and Imperial forces and I used my own slightly tweaked version of Worthington Games, "Clash for a Continent" American War rules, which are broadly similar to their "For Honour & Glory" War of 1812 set. I don't really care for solo games, as I get too wrapped up in one side or the other. With that in mind, I gave the French a two point command bonus, which is quite substantial. I used the battle described in CWJ as a basis for the orders of each side and then executed those orders as best I could, command rolls allowing. The ball opened with the French forming a large column and advancing led by their leader, General Du Fitz Badger straight towards the bridge, while their guns rushed forward and unlimbered covering the British side. The Argyll & Sutherland Highlanders under Colonel McFarlane got caught up in the woods on the British left supported by the Royal Americans under Colonel Stefan Von Kriegspieler. The British centre was hampered by a series of lousy command rolls to a frantic traffic jam in the centre, as the Fourth Foot and the Connaught Rangers tried to sort themselves. be kept well away from Spurlash proper while there was booze undrunk, womenfolk unmolested and a battle still to fight. The French cannonade was ineffectual, but the column rolled forward, charging across the bridge and wiping out the Royal Artillery gun crew that frantically tried to stop their advance with grapeshot. The British line tried to shake itself into some sort of shape, while the 18th came under fire from the French guns. Their leader, David O'H-, a European soldier of fortune of mysterious antecedents charged with the lightest of cavalry straight at the French guns. Meanwhile, the second Royal Artillery battery managed bloody the noses of the French column. The British line was much troubled by the advance across the river of the treacherous renegades, the Legion Irlandaise, under Jeffry Le Bear Bleu, who led them in skirmishing with the Fourth, while the woods behind were filled with lost and cursing MacFarlanes. The French heavy cavalry took the 18th in the flank and sent them streaming back across the river, utterly broken, but not without loss to themselves. However, the crisis had been reached in the centre, where the French column now masking the British line from its own guns, tried to close and lost its nerve. 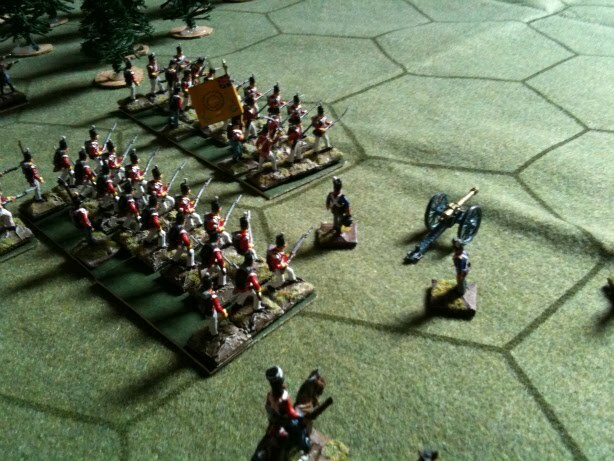 That slight delay bought enough time for a single crushing volley from the Rangers, the Fourth and a double charge of grapeshot from the frantic Royal Artillery. This swept the lead company away and this treatment continued while the French tried to form line. 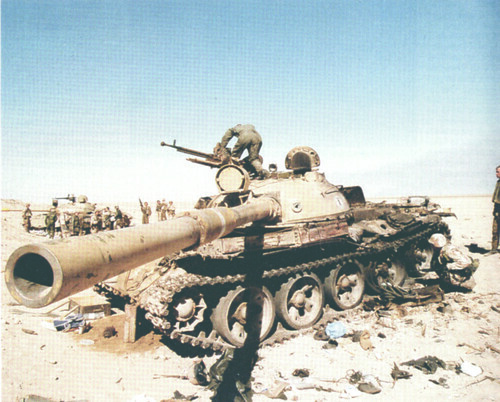 The French leader, the well known Stollenian mercenary General Schwartz, was trapped beneath his horse when the beast was hit and was unable to influence the battle at this vital moment. The Royal Americans managed to draw the attentions of the Legion Irlandaise, so the the Rangers and the Fourth could concentrate on killing the Frenchmen infront of them. A rallied remnant of the 18th gallantly drew the fire of the French guns, but were captured when they tried to recross the river. However, the loss of Schwartz at the vital moment insensible under his horse, where he was later captured by skirmishers from the Rangers cost the French dear and they began to melt away under the British volleys. The arrival of fresh troops in the shape of the furious and bepine needled Scotsmen sealed the French troops fate. Their centre broken, the French army began to retreat under the cover of their guns. The British army held their side of the bridge and licked their wounds, while Brigade majors galloped in all directions trying to gather the survivors of the broken cavalry and the infantry counted their dead. Not a bad game by any stretch and one marked by curious runs of luck, I believed the French had it wrapped up until they failed to charge home. *The mats look splendid, though I think I shall have to make some hills to measure. *I do not really care for solo-wargaming. I am too much of a social creature to really enjoy it. Also I can't drink while solo-wargaming, this is a serious problem. *My bases are a touch too wide for several battalions to be deployed in a line. I may have to do something about this. *An iPhone really is a very acceptable substitute for when you cannot find your dice. I must remember this. While I slog away happy at my Command & Colours: Napoleonics lists, I have had time to spare a thought for my much neglected copy of For Honour&Glory: War of 1812. This is a game similar to Command & Colours: Napoleonics produced by Worthington Games. It's not exactly to my tastes, but its not a bad game by any stretch of the imagination. Now as it happens I have a deplorable tendency to buy Ospreys by the dozen if they can be got cheaply. They are then unceremoniously turfed onto a shelf until I find time for them. I bought the Osprey "The United States Army 1812-1815" by James Kochan as part of a job lot when Mrs. Kinch and I were on honeymoon. At two pounds sterling per book it would have been a shame to leave them. So I have a conflict about which I know very little, but which would allow me to use my British figures with the addition of some Royal Marines and Militia. The Osprey would suggest that the American forces were clothed very much in the British style, which would allow me to use some more of the 600 odd HAT Pensinular British Infantry I bought last year. - there was a war between Britain and the United States of America between 1812-1815. - the ostensible cause of the war was the impressment of American sailors by the Royal Navy. - the war imperiled the supply of grain to the army in Spain. - the Americans attempted to invade Canada several times and failed. - the Royal Navy took a pounding at the hands of large American frigates until the action between the HMS Shannon and the USS Chesapeake. - the Americans won the battle of New Orleans after peace had been signed. - at some point during the proceedings someone, presumably a chap in a redcoat, burned down the White House (see above). Unfortunately, I seem to have lost the scenario booklet from For Honour & Glory, so I've very little idea of how many troops I'll need to play the scenarios provided. Counting the blocks in the game suggests that I'll need a simply impractical number of militia. I imagine I might use Imex's "Alamo Defenders" as militia, but six boxes of chaps is rather a lot, unless of course the militia wore uniforms and I can use some of my British infantry. Another research job, I think. Strelets Chasseurs of the Guard in Winter Dress. What fine fellows they are! The Dissertation beast is slain, it's biting jaws and clutching claws are still. I handed it in on Tuesday and await my mark. In other news, I am now working my way through the paper work that I have assiduously ignoring for the last few weeks. Of course, all work and no play makes Kinch a dull boy, so we took the evening off last night and watched a few episodes of House M.D. Mrs. Kinch attended to her needlework while I went through my list of figures for Command & Colour: Napoleonics. Going through my box of figures I've managed to scrape together 48 other ranks from the Strelets Guard Chasseurs box, a chef de battalion, one officer and a mounted colonel. 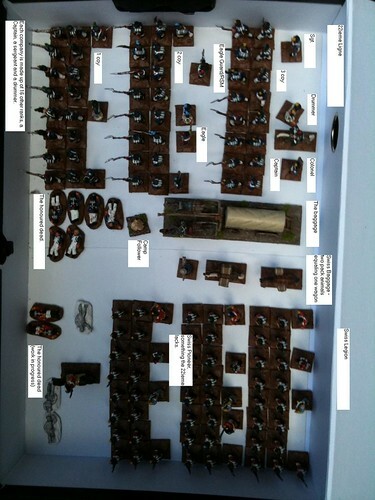 A quick study of SHQs website revealed a Guard Chasseurs Command pack that should fill those few gaps that remain. A email was sent and I hope to hear from them shortly. Once I have that battalion despatched, I shall move onto the next project; the British heavies. My British heavies arrived on Tuesday from Newline, which cheered me greatly. They are very handsome fellows and will do well. All that remains is to decide which regiment they should join. I hope to knock off one item of each list, French, British and Portuguese, in turn until I've filled my roster for Command & Colours Ancients. No news on the house at present, but we shall hopefully have word this week. In the mean time I have been reading Bernard Cornwells latest, The Fort. This is about an incident during the American War about which I know nothing. A young John Moore makes an appearance. It's not bad stuff in a blood and thunder sort of way and for those of us that like that sort if thing, this is exactly the sort of thing we like. I'm also taking a certain glee in my near complete ignorance of the period. 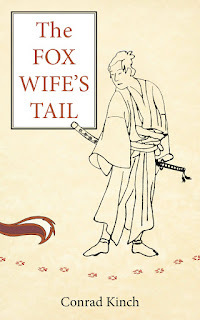 I know nothing of the incident the story is based on, which is a new experience for me in historical fiction. I rarely stray from familiar ground. I'm really looking forward to seeing how it all turns out. My dissertation is finished and ready to go. It has to be bound on Monday and delivered on Tuesday. It's just a relief to get it off my back and return to some real work. Contracts have arrived for Chateau Kinch, which suggests that all is well with the title and other legal mummery. Still no word on whether we shall be able to get a sufficient mortgage to secure Chateau Kinch. Irish banking being what it is, I'm not holding my breath. Between work, dissertation and the perils of house purchase, I have done nothing in the wargaming line - my apologies. I'm just completely exhausted at present, which brings me to another thought. While I'm sure professional military wargamers have considered the problem, commercial wargames never deal with the issue of sleep deprivation, despite the very real impact it has on capacity and morale. I can only think of one commercially produced set that has ever dealt with it. And a shiny sixpence to the smart boy who can name me another! Fortunately, dear reader, you do not have to rely on me for entertainment. Over at Donogh's you'll find pictures of his shiny new communists. Someone is going to have to chase Bob Cordery away from Command&Colours with a broom as he never seems to play a game with the same rules twice. Clive over at Vintage Wargaming has some great articles on terrain building and simple wargames released by Usbourne in the 1970s.